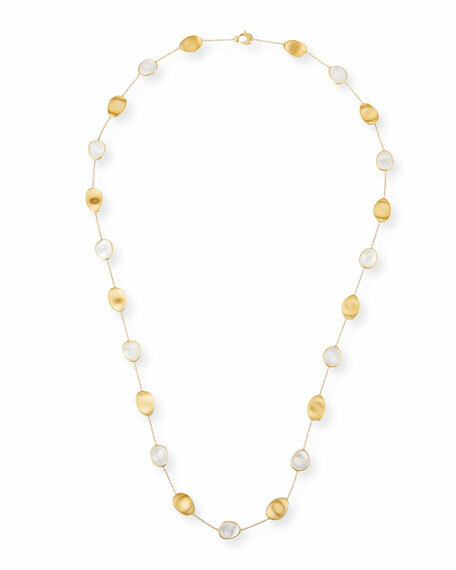 Marco Bicego Lunaria Long Mother-of-Pearl Station Necklace, 36"
Marco BicegoLunaria Long Mother-of-Pearl Station Necklace, 36"
Crystal encrusted tulip and stone necklace by Alexis Bittar. Polished 10-karat gold plated brass chain and hardware. Synthetic coral, lemon chrysoprase and quartz stations. Swarovski® crystal pavé open tulip stations. Approx. 38"L. Lobster clasp. Imported. Ashley Pittman "Mpenzi" long triple-charm necklace. Signature African horn and hand-hammered bronze. Alternating light horn and bronze circle links. Mixed horn, quartz and Swahili coin charm. Hook clasp with logo charm. Handcrafted in Kenya.